The Bonita Springs-Estero Association of REALTORS®, Inc. is a local trade organization of over 850 REALTOR® and more than 120 Affiliated industry members. Part of the National Association of REALTORS®, the largest trade organization in the United States with over 1 million members and Florida REALTORS®, with more than 127,000 members. B.E.A.R. provides its REALTOR® professionals with a wide range of services designed to empower members of the public through the opportunity to sell or purchase real property. In addition to B.E.A.R.’s affiliations, it offers Matrix-SWFLAMLS and operates the “B.E.A.R. Home Foundation” for Charitable Services. Founded in 1966, B.E.A.R. covers a service area of 108 square miles from the Lee/Collier line in the south to Alico Road in the north and from Estero Bay in the west to the Everglades in the east. The B.E.A.R. Association service area contains more new commercial space than any city in the region including both Coconut Pointe and Gulf Coast Town Center mega retail centers. Since its founding in 1966, B.E.A.R. has built its foundation on strong professional business relations in a small town environment of handshakes and personal relationships. The incorporated city of Bonita Springs, and the unincorporated areas of Lee County known as Estero, represent the largest partially developed region of Southwest Florida. Both residential and commercial real estate growth in this area should equal anything in metropolitan Florida’s finest coastal communities. Member companies of B.E.A.R. expect very successful growth in the decade ahead. Real Estate companies, agents and related businesses will discover financial opportunities exceeding anything seen in the past thirty years. B.E.A.R. continuously provides its members with state sponsored educational classes for license continuation, for national designations and professional growth programs. The Bonita Springs – Estero Association of REALTORS® recognizes those members who have sold Real Estate successfully. In 2015 with our annual Golden and Platinum BEAR awards. Golden BEAR recipients achieved 5 million in closed sales volume in 2015. 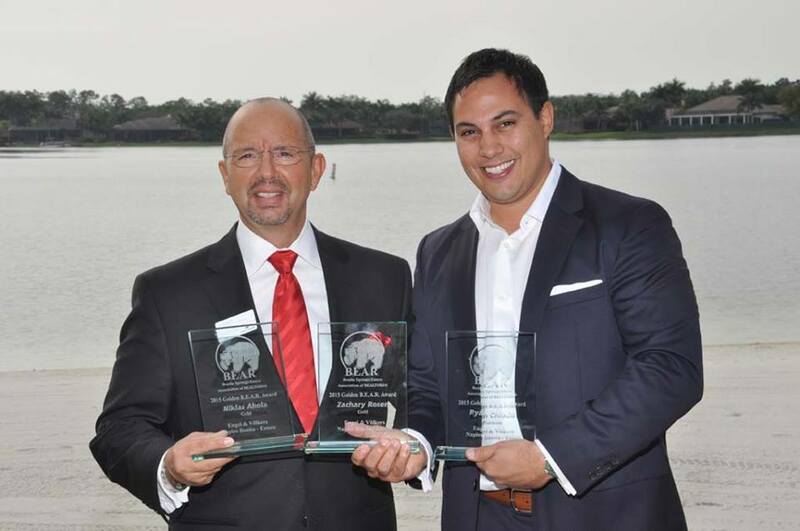 Platinum BEAR awards were given to Realtors® who achieved $10,000,001 and above in closed sales volume.